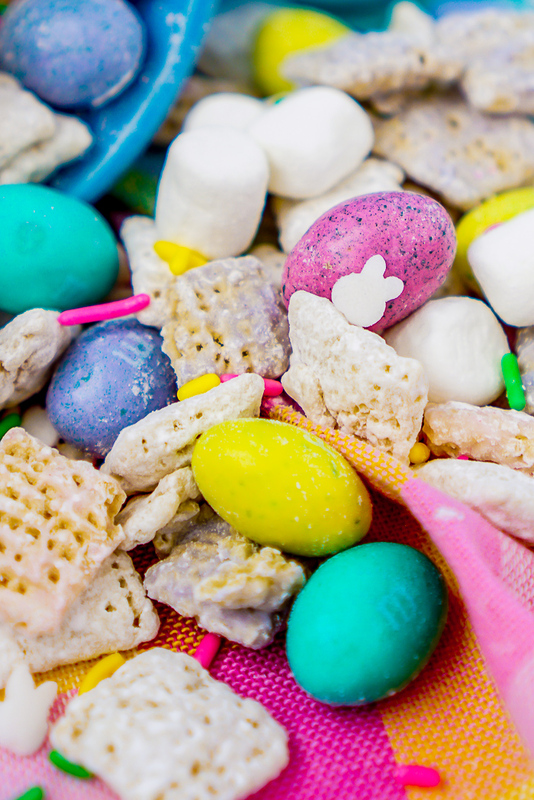 Easter Bunny Chow Recipe are the cutest muddy buddies so hop to it! It’s Spring Break here and Liam and I are the only ones in our family who did not go out of town. I’m not joking – the only one! My family scattered to St. Louis, Columbus, Washington DC, Hawaii and the Bahamas. 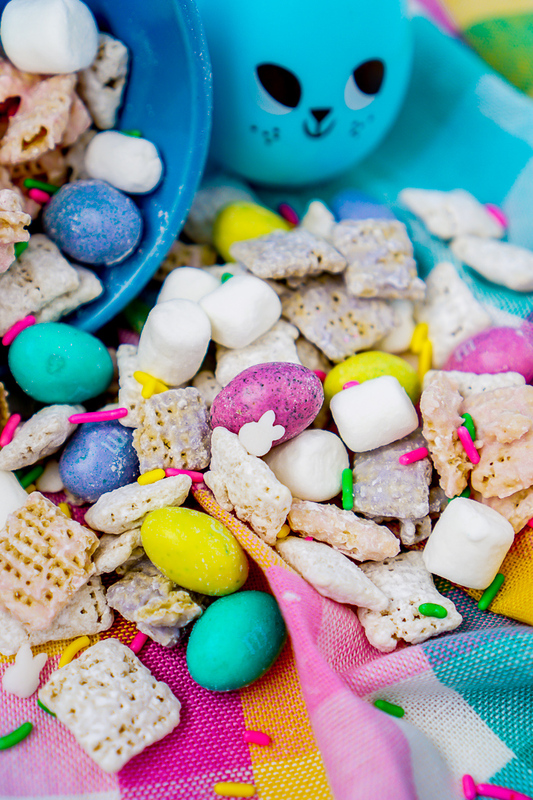 Since Liam and I were stuck here keeping the home front warm for everyone, I decided it was best time to make a fun spring puppy chow to enjoy. Say hello to my Easter Bunny Chow! I’ve always been a big fan of puppy chow and muddy buddies! (What do you call them?!) Until recently though, I always stuck with the traditional recipe. 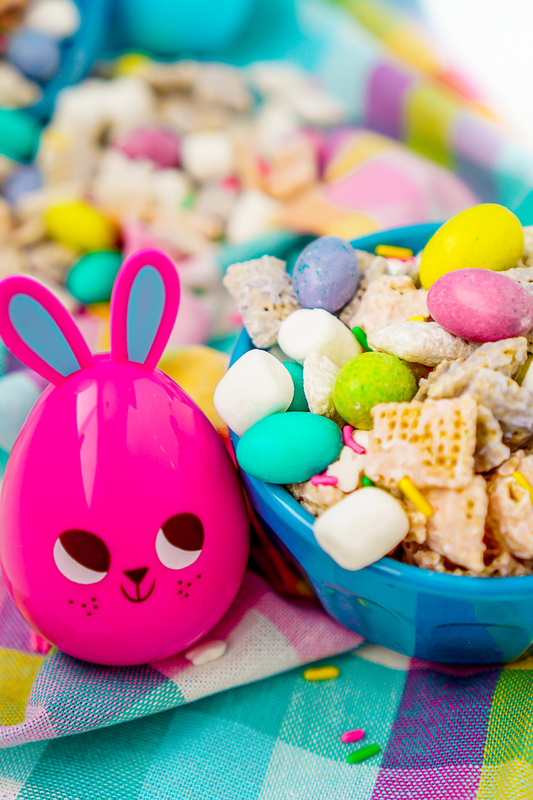 Now I like to switch it up and add fun touches like sprinkles or little marshmallows to represent little bunny tails and unique flavors – check out my Chocolate Covered Strawberry Puppy Chow! You will also see that I strive to make all my puppy chow recipes without nuts. My nieces has nut allergies (in addition to a few others), so I like making recipes kids will love that are also safe for her to enjoy! It’s definitely not a beach or a city full of national treasures, but it has been fun to snack on after Liam goes down for the night and I’ve settled in for some work. 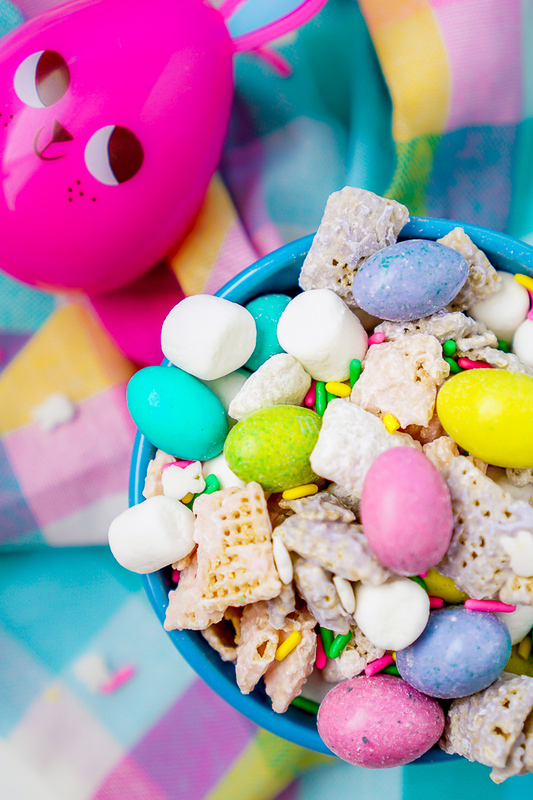 It’s the little things like a spring puppy chow recipe that always make life seem a little better. One note about the recipe – Look closely at the pictures and at the recipe, and you will see I coated some of the Rice Chex with colored white chocolate. I went with a pastel pink and purple. If you want more full color coverage, I recommend doubling the chocolate amount OR using candy melts. 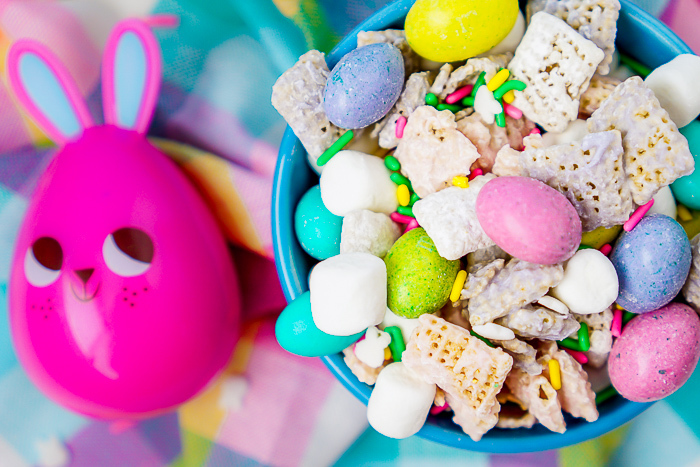 Time to Make the Cutest Easter Muddie Buddies Recipe!